Nice! I am very anxious to read the article. What a small world! 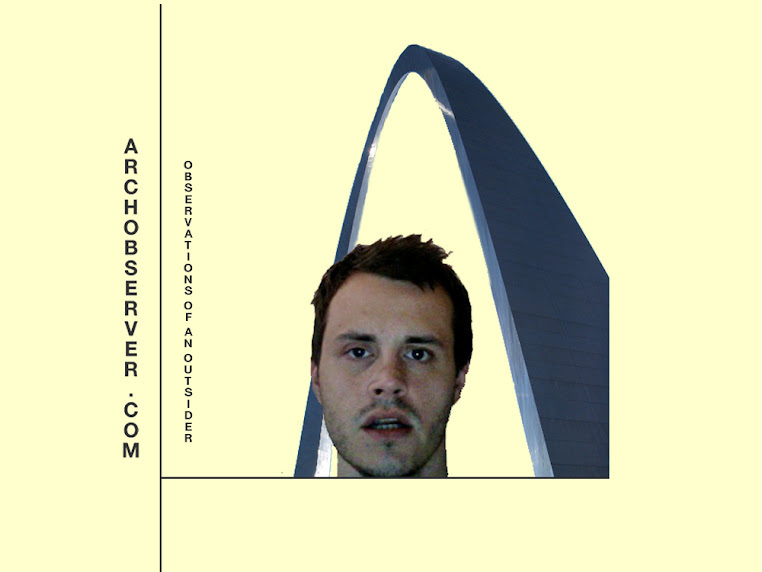 I myself moved from Chicago to St Louis 22 years ago. Also from Homewood. It is so neat to read about your adventures here. We also had a lot of the same comments about moving here, even being told that St Louis was the armpit of the country. We love it here and would never think about moving back. Hope you love it as much...welcome to St Louis! Good stuff man. While I had a not so stellar view of the Lou because of a prior stay, after reading your blog it makes me want to check it out again. Maybe. big head. this made me chuckle and smirk. Hey! Congrats on the Journal article. I love your blog, not sure about the new background color, something about it makes me a little...ill. It's considerably yellow. I've gotten numerous complaints about my picture but none of the background color. Thanks for the input! 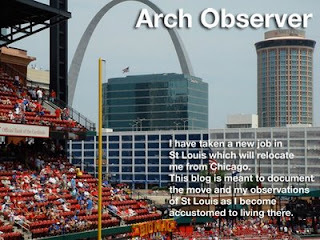 Just found your blog by way of the Journal article...welcome to St. Louis. I'll be checking in on you and hope you continue to enjoy this city. Have you checked out South Grand yet? Dunaway Books is a great place to lose several hours. CBGB's is lots of fun if you enjoy music. Tower Grove Park will host the Big Muddy Records BarBQ on Aug 9 (free) and the Festival of Nations Aug 29-30 (free). There are lots of great places to eat on South Grand too. Check it out! I moved to St Louis 5 years ago and I still love it. Keep up the good work. I met you one time and thoudht you were a good looking guy. Why would you sell yourself short with that terrible pic. Oh come on the terrible pic is perfect! It may be the worst picture ever taken and I am more than happy to share it with the world. However, you and just about everyone else who's seen it has asked the same thing. So, while I think it's funny to put such a bad pic of myself up, it's been more of a distraction than anything. I'll probably be changing it. To what? I don't know. So...like most I disagree with the new look...come on JIm...you can make it memorable but still better!!! SO I have thought of a fab idea!!! You take the pic I have of you on the stripper pole in your apartment (for the sake of your publicity I call it a stripper pole, true friends know otherwise). So you take the pic, cut out just yourself and superimpose yourself doing your pole moves on the arch!!!!!! what a great idea huh???? I will let you have it for free!!!! Are you sure that's not a mug shot taken after one of your escapades? i'd like to be the only person (apparently) who likes the stunned big head and the new look. yes, of course you're good looking, but, if you were to post a great looking picture of yourself and i didn't already know you, i'd just think you were a pretentious prick. just telling it like it is. your awesome stunned big head highlights your awesome personality. SO THERE. oh...and... i read the article. that is awesome jim. you're famous, and while your head is huge at least it's not pretentious. five stars.